An enjoyable, if sometimes rough, walk from Bowlees up on to Westernhope Moor via Flushiemere Beck before returning over James’s Hill, Hardberry Hill and Coldberry Gutter. I’d been considering for a while now a walk from the Bowlees Visitor Centre in Teesdale up on to Westernhope Moor on the Tees – Wear watershed. Given my current obsession for waterfalls the fact that there were a couple of good waterfalls so close to the start ensured that the route I’d planned out a few months ago suddenly moved higher up my ‘to-do’ list. It was a murky morning in Teesdale as we arrived at the visitor centre car park. For once I wasn’t disappointed by the cloud as it actually makes it easier to get a longer exposure when taking photos of waterfalls. To start then we followed the path on the east bank of Bow Lee Beck to visit Gibson’s Cave and Summerhill Force. Along the way we passed a fine waterfall which as far as I know doesn’t have a name. The main attraction though is Summerhill Force at the end of the path. The waterfall plunges several metres over a substantial lip of limestone. Behind and to the right of the waterfall is a dark recess which is known as Gibson’s Cave. The cave is named after William Gibson, a 16th century outlaw, who supposedly hid behind the waterfall while on the run from the constables of Barnard Castle. After taking numerous photos of the waterfall we retraced our steps back to the car park and crossed over the beck by the nearby footbridge to commence the route proper. Climbing up above the beck we passed through some lovely autumn woodland before entering the open access moorland of Friar House Allotment. Our plan was to cross Wester Beck and continue on the path to the farm at Broadley’s Gate. Unfortunately there was no footbridge over the beck and, with water levels high, it didn’t look passable on foot so we continued up the west bank of the beck until we reached grid reference NY905299. Here we eventually managed to find a way across and having joined the access road to Broadley’s Gate we followed it to the narrow Newbiggin to Westgate road and Watson’s Bridge. Without crossing the bridge we took a track heading north on the east bank of Flushiemere Beck which led us to the ruins of the old mine workings at Flushiemere House. The overcast skies lent a suitably sombre mood to the bleak surroundings of the ruins. From Flushiemere House we continued a bit further along the beck side until we became embroiled in dense bracken. At this point we decided to make a beeline for a rash of boulders we could see on the skyline above us to the right. After a steady pathless climb these rocks proved to be the northern end of Carr Crags. At this point the sun began to tentatively break through the gloom overhead and it was in the shelter of the rocks that we decided to sit and have our lunch before making the final push on to Westernhope Moor. After lunch we briefly followed a thin gamekeepers path above the crags. Along the way we passed a remarkable line of peat hags all of which were badly eroded on the side overlooking the valley below. Eventually we arrived at the summit of Westernhope Moor which is marked by a trig point next to a fence above a badly waterlogged shooting track. The cloud base was just caressing the top of the fell and above us the sun was still gainfully trying to break through. The next stage of the walk was a pathless mile and a half across the top of James’s Hill to reach a junction of walls and fences in the area marked on the map as Weather Beds. 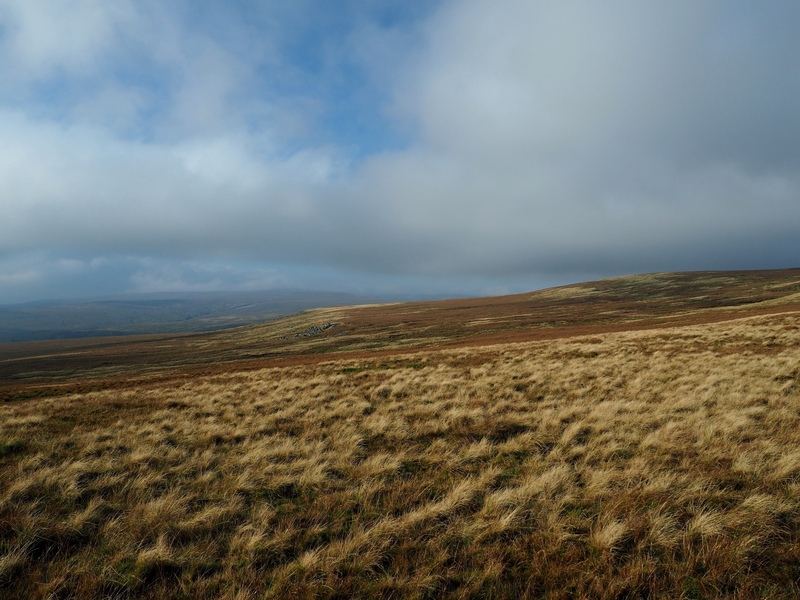 I do like a nice section of rough and tough moorland tramping and thankfully Paul is a fellow connoisseur of wild North Pennine moorland, which I guess is just as well when crossing places like James’s Hill. At Weather Beds we crossed through a gate and suddenly there was a nice grassy track for us to follow south along the ridge. This was a superb section, easy underfoot and with increasingly fine views of Teesdale as the sun finally began to win its battle with the cloud. Continuing on we passed an old mine reservoir to suddenly arrive at the dramatic cleft of Coldberry Gutter. A scheduled Ancient Monument, Coldberry Gutter is described on the Historic England website as, “the largest and most spectacular hush in the North Pennines.” Our next objective, the trig point on Hardberry Hill, was directly across Coldberry Gutter so we took a steep path down and then an equally steep path up the other side to access the trig point via a gate. I’d originally planned to next join the public right of way to the south of the trig point but instead we decided to drop back down into Coldberry Gutter and descend down its western side, so as to get a closer look at this remarkable feature. Having explored a bit of Coldberry Gutter we then entered Red Grooves Hushes, a smaller series of hushes below Coldberry Gutter. Somewhat embarrasingly I suddenly had a five minute spell where I didn’t seem to be able to stay on my feet and it is fair to say I slid and slipped my way along Red Grooves Hushes. To complete the walk we returned to Bowlees by fording Newbiggin Beck below Hill Cottage and then on to Hood Gill where my attempts to avoid any encounters with bovine kind ended in failure when we had to cross a pasture full of beef bullocks. I think it is probably fair to say that this isn’t a walk that would appeal to everyone, some of the stream crossings were awkward and some of the walk was rough underfoot. For those who love the high North Pennine moors though this would make a fine outing with the added bonus of two classic waterfalls right at the start (or end). For enthusiasts of industrial archaeology a visit to Coldberry Gutter is also a must.